If you miss a day, go back the raffle will be open until the 24th. · At each site, I will have an excerpt for Kidnapped Hearts or an unedited excerpt from one of the sequels, Deceptive Heart’s and Mystic Hearts. · In each excerpt, one word will be missing. · Write each missing word down in order by how they're listed on caitjarrod.com. The words will form a question and the answer. · On the 23rd or after, go to cait.jarrod@aol.com to enter the grand prize raffle by entering the question and answer. A winner will be picked on the 26th. Her heart pounded and a hand flew to her chest. She stumbled backwards and fell to the ground. A solid black cat ran across the yard and disappeared down the cellar steps. Relief washed over her, yet a pain impaled her head. She sat up and touched the wound. Everything seemed foggy. Full moon…black cat. If a ghost flew through the air or a witch rode a broom in front of the moon, the night would be a perfect scary movie. “____ you okay?” A raspy male voice came from in front of the schoolhouse. The air left her lungs and her heart stopped beating. She waited to observe the owner of the voice. Her throat constricted. A breeze chilled her face. The need to wipe her mouth grew strong, but her hands wouldn’t move from the ground. She swung her eyes to the right…to the left…up. No one. Jot down the missing word. And don’t forget to check http://caitjarrod.com/ for the next site. 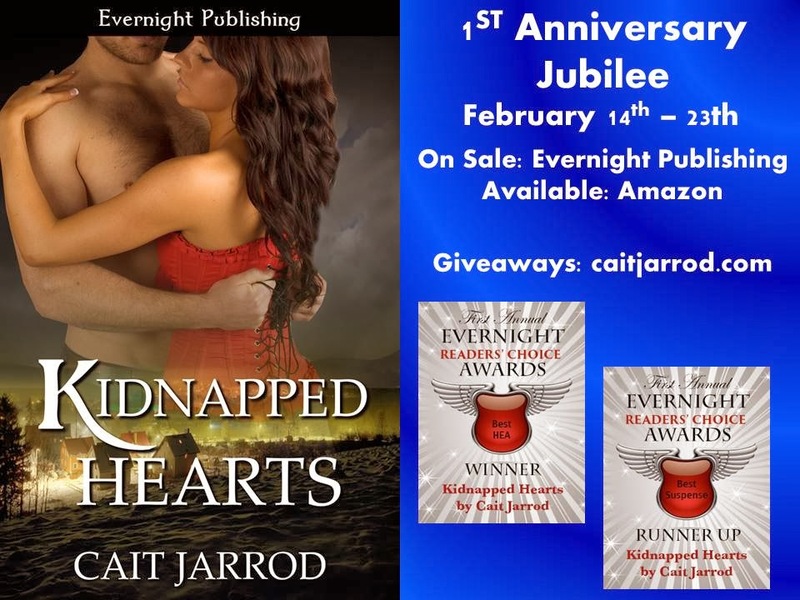 Raffle for Cait Jarrod’s ebook copy of Kidnapped Hearts will run from the 24th. This is a great read. Whether you win it or not, it needs to be on your TBR list. The word might be 'Are' Sounds like a fun raffle and great reading! Thanks Aubrey and Rolynn! Thank you Just Romantic Suspense!